Cubed3 is a gear and gearbox design specialist offering solutions to a variety of customers worldwide. Designing specialised and innovative gears and gearboxes for clients is Cubed3’s specialty and often these designs are taken through to the prototype and manufacturing stage. Cubed3's capabilities are assisted by Solid Works, MSC Visual Nastrans, Dynamic and Static Finite Element Analysis (FEA) & UTS Gear Softwares. Stephen Horsfall, Managing Director and Design Engineer, completed his practical engineering qualification with hands-on 15 years gear manufacturing experience. Stephen then specialised in the gear design industry and has become one of New Zealand’s leading design engineers. Quality and variation is what we do best. When completing a design project, Cubed3 utilises Finite Element Analysis which helps tremendously in producing stiffness and strength analysis. This also helps in minimizing weight, materials, and costs. 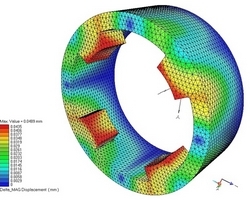 Finite Element Analysis allows detailed visualization of where structures bend or twist, and indicates the distribution of stresses and displacements. It also allows entire designs to be constructed, refined, and optimized before the design is manufactured. Cubed3 believes the benefits of Finite Element Analysis include increased accuracy, enhanced design, better insight into critical design parameters, virtual prototyping, fewer hardware prototypes, a faster and less expensive design cycle, increased productivity, and increased revenue. Cubed3 and its team have built numerous gearbox prototypes. Clients find the benefits of outsourcing their design and manufacture to Cubed3 to obtain a fixed price and rapid productions. Based on the numerous test rigs that we have built for our clients as part of the prototype development stage, we have found that the assembly of test rigs and the introduction of Finite Element Analysis to have substantially decreased the time taken to take products from concept to the production line. It is primarily through improved initial prototype designs, using Finite Element Analysis, that testing and development have been accelerated.